Gasket Sealant, Aviation, 16 Oz. TWO OF THE OLD SCHOOL FORD 300 STRAIGHT SIX. IT'S THE TOTAL REBIRTH OF A CLASSIC PIECE OF HISTORY. 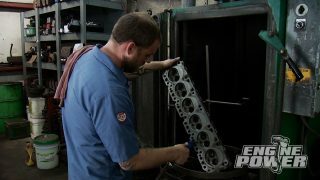 (MIKE)>> JOHN'S BACK FROM THE MACHINE SHOP WITH THE FIRST FORD INLINE ENGINE WE'VE EVER DONE. NOW OUR GOAL IS TO SEE A POWER AND TORQUE IMPROVEMENT WITH OFF THE SHELF AFFORDABLE PARTS. HOW WAS THE TRIP? (JOHN)>> IT WAS ALRIGHT, OTHER THAN I BROKE THE VALVES. (MIKE)>> I WAS GONNA SAY, IT DIDN'T LOOK TOO GOOD. WHAT HAPPEN THEIR? (JOHN)>> I DROPPED IT GOING DOWN THE STAIRS. (JOHN)>> YEAH DON'T TELL TOMMY THOUGH. I'M JUST GONNA TELL HIM I FOUND IT THAT WAY. (MIKE)>> GLAD IT WASN'T YOUR TOE. (JOHN)>> I GUESS WE'LL JUST CLAMP IT DOWN, GRIND IT OUT, AND THEN WE'LL RUN SOME TACKS AND DO THAT COLD METHOD. I'LL GET TOMMY TO MAKE SURE I DON'T DO NOTHING CRAZY WRONG. (JOHN)>> IF THAT WAS A CHEVY IT WOULDN'T HAVE HAPPENED. 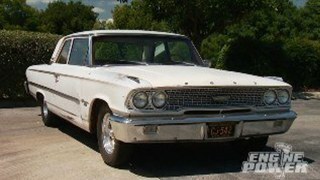 (MIKE)>> FORD, CHEVY, WHATEVER, TODAY WE'RE USING A LIST OF OFF THE SHELF PARTS FROM SUMMIT RACING FOR THIS BUILD. 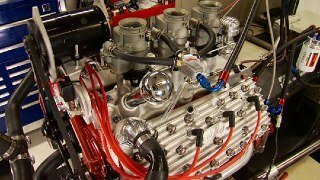 NOW THAT INCLUDES A COMP CAM, AN OFFENHAUSER INTAKE MANIFOLD, A SET OF SILVA LIGHT PISTONS, A HOLLEY CARBURETOR, SEVERAL FEL PRO GASKETS, AND OIL PAN FROM DORMUND, A DUI DISTRIBUTOR, AND A HEADMEN HEADER. NOW THESE PARTS WILL GO ON IN JUST A FEW MINUTES, BUT FIRST WE NEED TO SERIOUSLY ADDRESS THAT CRACK. (TOMMY)>> SO WHAT EXACTLY HAPPENED HERE BIG JOHN? (JOHN)>> I MIGHT HAVE DROPPED IT DOWN THE STAIRS. (TOMMY)>> WELL THE GOOD THING IT'S A NICE CLEAN BREAK, AND THE MATERIAL WE'RE WORKING WITH, SINCE IT JUST COME FROM THE MACHINE SHOP IS ALL GOOD AND CLEAN. SO ALL WE HAVE TO DO NOW IS KINDA GRIND IT OUT AND BEVEL IT SO WE'VE GOT A PLACE TO WELD. (MIKE)>> JOHN WILL BEVEL THE TWO PIECES TO BE WELDED TOGETHER. THIS WILL ALLOW THE WELD TO PENETRATE MORE THAN JUST THE SURFACE OF THE PARTS. (JOHN)>> WHAT DO YOU THINK THEIR TOMMY, NOT ENOUGH? (TOMMY)>> GET RIGHT THERE IN THAT CURVE. (MIKE)>> TOMMY'S DONE A LOT OF THIS TYPE OF WELDING, AND AFTER JOHN'S STAIR INCIDENT, HE'S EAGER TO LEARN. (MIKE)>> THE BELL HOUSING IS THE BEST THING TO USE AS A FIXTURE. THE BROKEN PIECE OF THE BLOCK WILL LOCATE ITSELF WITH A DOWEL AS WELL AS TWO FASTENERS. (TOMMY)>> JOHN YOU EVER DONE ANY STICK WELDING AMOUNT TO ANYTHING? (JOHN)>> YEAH IN HIGH SCHOOL AT THE FOURH. (TOMMY)>> WELL MAN, WHENEVER YOU'RE DOING A REPAIR LIKE THIS ON CAST IRON YOU WANT TO USE NICKEL ROD, BECAUSE THERE'S KIND OF A TECHNIQUE YOU NEED TO DO BECAUSE DURING THE WELDING PROCESS THAT CAST STARTS TO EXPAND. AND WITH THE TAP OF A HAMMER THIS NICKEL WILL COMPRESS, SOAK UP ALL THAT EXPANSION. (MIKE)>> BEFORE YOU START SPARKING AWAY, FIND A PIECE OF SCRAP MADE OUT OF THE SAME MATERIAL. THIS IS A GOOD WAY TO GET THE WELDER SETTING RIGHT. (TOMMY)>> OH YEAH, WE'RE GOOD RIGHT THERE. 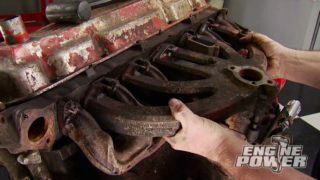 (MIKE)>> GET YOU WARMED UP, AND LESSEN THE CHANCE OF FURTHER DAMAGING THE PARTS TO BE REPAIRED. THE TAPPING COMPRESSES THE EXTRA CARBON THAT IS NATURALLY IN FLAKE FORM IN CAST IRON. IT HELPS TO CLOSE THE VOIDS BETWEEN THEM. (MIKE)>> NOW KEEP IN MIND, IF TOO MUCH HEAT IS INTRODUCED AND IT COOLS RAPIDLY, THE METAL HARDENS MAKING IT EXTREMELY DIFFICULT TO TAP OR DRILL. (JOHN)>> NOW AS LONG AS SHE HOLDS TOGETHER THAT'S ALL WE NEED. (TOMMY)>> WELL IT'LL HOLD IT UNTIL IT BREAKS, THAT'S FOR SURE. (JOHN)>> THANK YOU TOMMY. THAT'S WHAT I LOVE ABOUT BUILDING ENGINES. THE INDUSTRY KEEPS CRANKING OUT NEW TECHNOLOGY AND THE AFTERMARKET'S RIGHT ON THEIR HEELS. BUT SOMETIMES YOU GET TO LEARN AN OLD SKILL FROM THE PAST. WE'LL BE BACK. (JOHN)>> THE BLOCK IS COMING OUT OF THE WASHER FOR THE FINAL TIME AFTER REMOVING ALL THAT GRINDING DEBRIS. WE'RE GONNA ASSEMBLE THIS ENGINE A LITTLE DIFFERENT, NO ENGINE STAND. AND THAT'S BECAUSE THESE ENGINES ARE SO LONG AND NOSE HEAVY THAT THEY'VE BEEN KNOWN TO BREAK OFF AN ENGINE STAND. IT'S ALSO A GOOD IDEA BECAUSE ON A TIGHT TOLERANCE ENGINE THEY CAN BOW SO MUCH THAT IT CAN ACTUALLY LOCK UP A CRANK. SO WE'RE GONNA USE THIS STURDY ALL STEEL TABLE FOR THE ENTIRE ASSEMBLY. 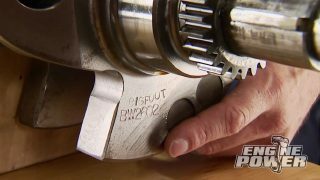 (MIKE)>> SEALED POWER CAM BEARINGS WILL BE THE FIRST THING TO GO IN. NOW USING THE INSTALL TOOL, CAREFULLY POSITION THE BEARING. NOTICE THE MARK SO THE OIL PASSAGES LINE UP WITH THE GALLEYS IN THE BLOCK. NEXT UP ARE THE OIL GALLEY PLUGS. NOW IF YOU MISS ONE, YOU'LL GET A COUPLE OF WARNINGS. AN OILY MESS AND/OR NO OIL PRESSURE. 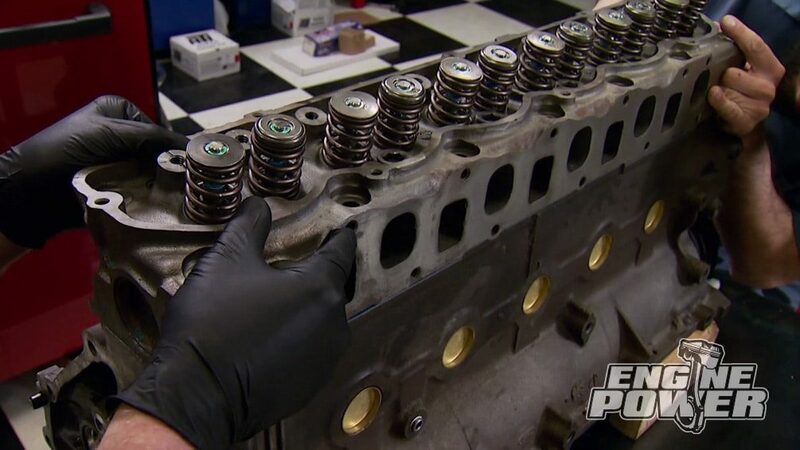 USING A GENEROUS AMOUNT OF LOCTITE GASKET SEALER, INSTALL THE FREEZE PLUGS SO THE LEADING EDGE OF THE LIP IS JUST BEHIND THE EDGE OF THE BLOCK. THE ROTATING ASSEMBLY CAN GO IN NOW. FIRST A SET OF SEAL POWER MAIN BEARINGS CAN DROP IN THE SADDLES. THE THRUST BEARING ON THE 300 IS THE FIFTH MAIN BACK. NOW LUBE THEM WITH ROYAL PURPLE ASSEMBLY LUBE. NOW OUR CAST STEEL CRANK SHAFT'S GOT A PRETTY HEALTHY STROKE TO IT AT THREE POINT NINE 80, AND IT'LL HANDLE A LOT MORE POWER THAN YOU THINK. NOW WHAT IT WON'T LIKE IS A LOT OF RPM. YOU GET THIS THING ABOVE 5,000 AND KEEP IT THERE, AND YOU WILL FIND OUT THE LIMITATIONS OF THIS CRANK SHAFT. BUT NOT TO WORRY, THESE THINGS WERE DESIGNED TO MAKE IT ALL DOWN LOW. GENTLY DROP THE CRANK INTO PLACE. THEN DROP THE CAPS ON IN ORDER OVER THE ARP MAIN STUDS THAT WILL HOLD THE BOTTOM END TOGETHER. AND WILL PLENTY OF LUBE TORQUE THEM TO 70 FOOT POUNDS. 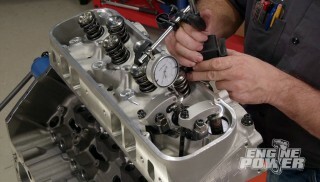 (MIKE)>> THE FACTORY RODS MEASURE IN AT SIX POINT TWOONE INCHES CENTER TO CENTER. AND REMEMBER, WE RESIZED THEM USE NEW ARP ROD BOLTS. NOW THE PISTONS ARE SILVA LIGHTS FROM SUMMIT RACING. PUSH THE PIN THROUGH MAKING IT EVENLY SPACED IN BOTH SIDES. AS THE ROD COOLS, THE SMALL END CONTRACTS, MAKING A PRESS FIT ON THE PIN. (JOHN)>> NOW THE RINGS WE CHOSE ARE FROM SUMMIT RACING, AND THEY'VE GOT A PRETTY COOL STORY BEHIND THEM. THE 300 INLINE SIXES WERE GONNA COST A LITTLE BIT TOO MUCH IN MY OPINION. SO WHAT WE DID WAS JUST SWAP THEM OVER TO A SMALL BLOCK CHEVY SET IN THE SAME SIZE. WE WERE ABLE TO SAVE OVER $10 BUCKS. 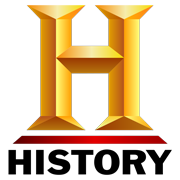 NOW THE THREESIXTEENTHS OIL RING PACKAGE AT ONE TIME WAS ALMOST INDUSTRY STANDARD BETWEEN THE BIG THREE. NOW THESE TWO FACTORY REPLACEMENT COMPRESSION RINGS ARE THE SAME SIZE AT 564'S. WE'RE LUBING THE CYLINDER WALLS WITH AUTOMATIC TRANSMISSION FLUID. THIS WILL ALLOW THE RINGS TO SEAT AND SEAL UP A LOT FASTER. (MIKE)>> FOR YOU GUYS THAT DON'T HAVE MICROMETERS, THERE IS A GONO GO METHOD WHEN IT COMES TO MEASURING BEARING CLEARANCES. IT'S CALLED PLASTIGAUGE, AND YOU CAN FIND IT AT YOUR LOCAL AUTO PARTS STORE FOR ABOUT $35 CENTS. OURS IS IN THE ONE TO THREE THOUSANDTHS RANGE, AND WE'RE LOOKING FOR TWO TO THREE IN OUR ROD BEARING CLEARANCE. CUT ABOUT THREE QUARTERS OF AN INCH OF THE PLASTIC GAUGE OFF. NOW OPEN THE PAPER AND PULL OUT THE GAUGE. PLACE IT BETWEEN THE LUBED ROD BEARING AND THE DRY JOURNAL. THE ASSEMBLY RIGHT AFTER THE BREAK. DURING BREAK IN. 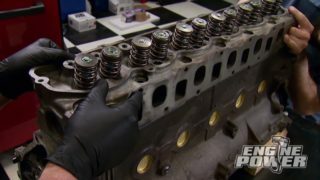 THIS IS A SINGLE PATTERN CAM SHAFT, WHICH MEANS GROSS VALVE LIFT FOR THE INTAKE AND EXHAUST IS THE SAME AT 456 THOUSANDTHS. NOW DURATION AT 50 IS 219, AND THE LOBE SEPARATION ANGLE IS 110 DEGREES. THE OLD TIMING GEAR MATERIAL WAS NYLON. NOW IT HAD TO BE REMOVED TO GET THE FACTORY RETAINER PLATE OFF. THIS ONE IS MADE OF STEEL AND WILL SLIP INTO PLACE WITH THE TIMING MARKS ALIGNED. FOOT POUNDS, USING SILICONE TO HOLD THE UNIQUE LOOKING TIMING CHAIN COVER GASKET IN PLACE, AND LOOSELY BOLT ON THE ORIGINAL COVER FOR NOW. INSTALLING THE BALANCER WILL CENTER THE SEAL ON THE BALANCER'S HUB AND AVOID PREMATURE SEAL FAILURE. SO THE DECK IS UPRIGHT. WE'RE USING SMALL BLOCKS OF WOOD TO MAKE IT MORE STABLE ON THE TABLE. (JOHN)>> SOLID AS A ROCK. (MIKE)>> JOHN SPENT SOME TIME GETTING THE HEAD READY FOR REASSEMBLY. ALONG WITH IT HE ALSO REWORKED THE STOCK VALVES. (JOHN)>> COMP CAM SPRINGS WILL COMPLIMENT THE MORE AGGRESSIVE CAM SHAFT, AND THEY ALSO SENT RETAINERS AND LOCKS TO HOLD THEM IN PLACE. A FEL PRO GASKET WILL MAKE THE SEAL BETWEEN THE HEAD AND THE DECK. THE HEAD IS LONG AND HEAVY, SO AN EXTRA SET OF HANDS IS A GOOD WAY TO GET IT ON SAFE WITHOUT DAMAGING THE GASKET. NUTS WITH THE MATCO TORQUE WRENCH TO 85 FOOT POUNDS. WITH THE ROCKER STUDS INSTALLED WE CAN DROP IN THE LUBED HYDRAULIC FLAT TAPPET LIFTERS. NOW THEY CAM FROM COMP AND WERE SUPPLIED WITH THE CAM AS A KIT. 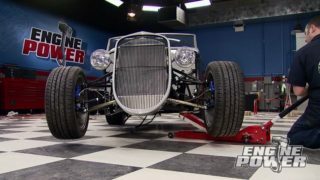 (MIKE)>> THE PUSH RODS ARE NEXT. NOW JOHN ONLY REMOVED A SMALL AMOUNT OF MATERIAL FROM THE HEAD SURFACE. SO HE'S HOPING A STOCK LENGTH PUSH ROD WILL STILL WORK. WITH A LITTLE DYE CHEM ON THE VALVE'S TIPS, WE CAN BOLT ON TWO ROCKERS AND ROTATE THE ENGINE. NOW WE'RE LOOKING FOR A MARK IN THE DYE CHEM THAT IS NARROW AND IN THE CENTER OF THE TIP, LOOKS PERFECT. THESE COMPS HAVE A ONESIX RATIO AND AN ALUMINUM BODY. THEY FIT A SEVENSIXTEENTHS STUD, AND THEY WILL BE TIGHTENED TO A HALF TURN PAST ZERO LASH USING A SUMMIT RACING LASH ADJUSTING WRENCH. IT'S GLOSS BLACK AND DYNO PROVEN TO 500 DEGREES. TO FLATTEN THE AREA AROUND THE HOLE. AFTER CLEANING IT, APPLY AN EVEN UNIFORM COAT OF PRIMER AND LET IT DRY. FOR THIS NEXT STEP YOU CAN USE A HEAT GUN LIKE THIS OR AN OVEN. NOW THE GOAL IS TO WARM THE PART UP SO IT'S WARM TO THE TOUCH. THIS WILL MAKE THE WRINKLE PLUS STICK REALLY GOOD TO THE PRIMER AND LESSEN THE CHANCE OF A RUN. AND HERE IT GOES. ONCE YOU HAVE TWO TO THREE GOOD COATS ON, CONTINUE TO HEAT THE PART. NOW WATCH CLOSE, THIS IS NOT TIME LAPSE VIDEO. IT'S REAL TIME! I DON'T KNOW EXACTLY HOW IT WORKS BUT IT DOES, AND I HAVE TO SAY ITS PRETTY COOL. AFTER LETTING IT SIT FOR A COUPLE OF HOURS, I CAN ADD THE COLOR THAT GETS IT BACK TO ITS ROOTS, FORD BLUE. THIS THING OFF THE TABLE FOR GOOD. AND WRAPPING UP THE BOTTOM END IS JUST A FEW SHORT STEPS AWAY. THEN WE CAN GET IT ON THE DYNO CART, OR IN YOUR CASE, PROBABLY GO AHEAD AND DROP IT INTO THE ENGINE BAY. 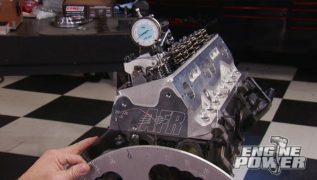 TO SUPPLY OIL TO THE ENGINE A MELLING HIGH VOLUME OIL PUMP WE ORDERED FROM SUMMIT RACING. TO KEEP IN PLACE, ARP BOLTS. THE PUMP'S PICK UP CAN BOLT UP NOW. HERE'S AN EASY WAY TO GET AN EXTRA SET OF HANDS. FELL PRO OFFERS THESE OIL PAN INSTALLATION STUDS THAT GUIDE THE GASKET AND PAN TO THE BLOCK. AND EVEN HOLD IT IN PLACE SO YOU CAN START THE FASTENERS. THEY ALSO KEEP YOU SAFE CAUSE YOU DON'T HAVE TO LOOK UNDER THE ENGINE TO ALIGN IT. 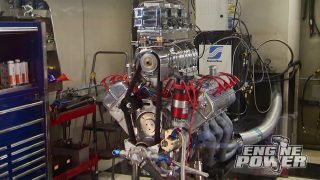 (MIKE)>> THE REST OF THE PARTS WE PUT ON IN THE DYNO ROOM. THE OFFENHAUSER DUAL PORT ALUMINUM INTAKE HAS SEPARATE RUNNER SYSTEMS FOR THE PRIMARIES AND SECONDARIES. 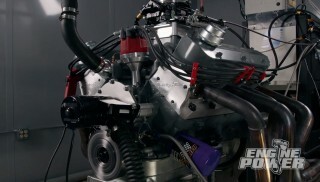 THIS DESIGN WILL ADD POWER ACROSS THE ENTIRE RPM RANGE. 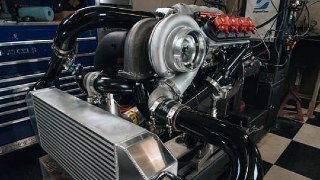 THE 390 CFM HOLLEY FOUR BARREL IS DESIGNED FOR SMALL VEIGHTS AND SIX CYLINDER ENGINES. LET OUR 300 BREATH. 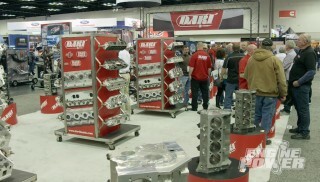 FOR IGNITION A DUI HEI DISTRIBUTOR FROM SUMMIT RACING. TO THE SPARK PLUGS. BEHIND THAT ALUMINUM PULLEY IS A ROCK AUTO STOCK REPLACEMENT WATER PUMP. WITH THE ENGINE PRIMED WITH COMP BREAK OIL, AND 93 OCTANE IN THE TANK, WE'RE SET. YOU GOT IGNITION, READY? (MIKE)>> JOHN WILL SET THE TIMING TO 24 TOTAL DEGREES. 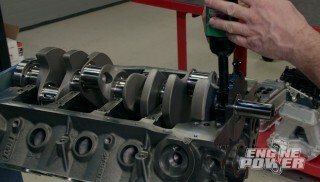 FLAT TAPPET CAMS REQUIRE A BREAK IN AT HIGHER RPM'S. DON'T WORRY ABOUT ALL THAT SMOKE, IT'S JUST HEADER PAINT BURN OFF. (JOHN)>> IT DEFINITELY SOUNDS DIFFERENT. WITH THEIR 10 W-30 MUSCLE CAR STREET ROD FORMULA. I'M PROUD OF YOU, YOU'RE NOT NERVOUS TODAY. (MIKE)>> BECAUSE IT'S ONLY SIX AND NOT EIGHT? 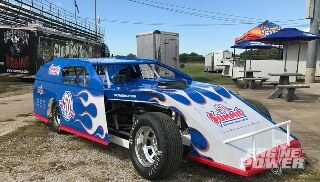 NOW WE DIDN'T BUILD A RACE ENGINE, WE SIMPLY BROUGHT A STOCK ONE BACK TO LIFE, A LITTLE STRONGER THAN BEFORE. THAT THING'S JUST WICKED SOUNDING. 297,200, THAT'S REALLY CONSISTENT. (JOHN)>> THAT'S SMOOTH AS GLASS MAN. (MIKE)>> MUCH MORE, 306, 203! (JOHN)>> WHICH IS ALL TRUCK, ALL TOW, ALL DAY. (MIKE)>> NOW THAT THE AFR'S ARE WHERE WE WANT THEM, WE KNOW WE'LL FIND A LITTLE POWER WITH THE TIMING CHANGE. 305, 206! (JOHN)>> THIS THING NEEDS TO GO IN A '77 F-150 ON LIKE 35 INCH SUPER SWAMPERS AND JUST CUT DOUGHNUTS IN A FIELD. (MIKE)>> IS THAT GONNA SET IN YOUR BACK YARD. (JOHN)>> THAT'S WHAT I'D DO WITH IT, THAT'S EXACTLY WHAT I'D DO WITH IT. SO THERE YOU GO. YOU GUYS HAVE BEEN WRITING IN WANTING US TO DO SOMETHING A LITTLE DIFFERENT, AND HERE IT IS. TWO LESS CYLINDERS AND WE STOOD THEM STRAIGHT UP. SO DON'T BE AFRAID TO WRITE IN WITH YOUR IDEAS. WE'LL TRY TO GET TO THEM AND BUILD THESE THINGS TOGETHER. 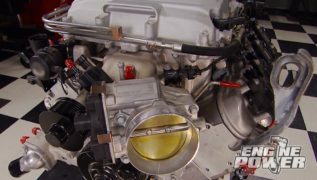 (MIKE)>> FOR YOU GUYS THAT LIKE A SHORTER ENGINE WITH A COUPLE EXTRA CYLINDERS, I'M GONNA SHOW YOU HOW TO INSTALL A CANTON CRANK WIPER ON A SMALL BLOCK FORD 302. IT'S A CHEAP WAY TO FREE UP SOME EXTRA PONIES, AND HERE'S WHY. THE OIL PAN ITSELF. NOW IT'S JOB IS TO WIPE OIL FROM AROUND THE BIG END OF THE ROD AND THE COUNTER WEIGHT. IT'LL ALSO DISRUPT THE VORTEX OF OIL AND GET IT DOWN INTO THE PAN FASTER. IT NEEDS TO SIT AS CLOSE TO THE ROTATING PARTS AS POSSIBLE BUT STILL HAVE A SMALL AIR GAP FOR PART EXPANSION WHEN UP TO TEMPERATURE. THIS ONE FITS PRETTY GOOD OUT OF THE PACKAGE, BUT IT'S NOT AS CLOSE TO THE COUNTERWEIGHTS AS I LIKE TO SEE IT. BY SLOTTING THESE HOLES A LITTLE BIT, WE CAN MOVE THE ENTIRE WIPER INWARD AND CLOSE THE GAP. NOW A STEEL BURR WORKS GREAT FOR THIS. JUST LET IT DO THE WORK. DON'T BE A HERO EITHER. USE A VICE OR RISK THE BURR CATCHING THE PART AND INJURING YOUR HAND. NOW WE HAVE A TIGHTER GAP BUT STILL ENOUGH CLEARANCE FOR WHEN EVERYTHING HEATS UP AND EXPANDS. A LITTLE SILICONE BETWEEN THE PAN RAIL AND THE WIPER WILL SEAL IT UP THE RIGHT WAY. THE POWER GINS FROM THIS MODEL VARY FROM TWO TO THREE ON MILD PERFORMANCE ENGINES TO SEVEN TO 10 ON HIGH RPM RACE ENGINES. PLUS YOU GET BETTER OIL CONTROL, LESS ROTATING MASS, AND IT REDUCES OIL FOAMING ON THE SURFACE. NOT A BAD UPGRADE FOR 25 BUCKS. 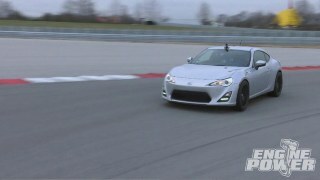 BETTER PERFORMANCE AND FUEL ECONOMY. NOW FAST DIGITAL DUAL SENSOR AIR/FUEL METER WILL HELP GET YOU THERE. THIS THING ALLOWS YOU TO READ THE SENSORS INDIVIDUALLY OR AVERAGE THEM TOGETHER FOR A MORE ACCURATE READING. THIS THING HAS A BUILT IN DATA LOGGER THAT PLAYS BACK ON THE DISPLAY SCREEN. SO NO LAPTOP IS NEEDED. NOW IT HAS OUTPUTS FOR DIGITAL GAUGES AND EXTERNAL DATA LOGGERS UNDERNEATH THE HEAT SHRINK. THIS THING'S AVAILABLE FOR GASOLINE, DIESEL, AND METHANOL ENGINES WITH PRICES STARTING UNDER $470 BUCKS. FAIRLY LONG INCH AND FIVEEIGHTHS PRIMARIES. AND THOSE THREE INCH COLLECTORS THAT DUMP AT THE END OF THE ENGINE BAY, GIVE YOU EXCELLENT GROUND, STEERING, AND SUSPENSION CLEARANCE. NOW THEY COME WITH THE SILVER CERAMIC COATING, REDUCERS, AND THE HARDWARE YOU NEED TO INSTALL IT FOR UNDER $420 BUCKS. NOW THAT'S ALL THE TIME WE'VE GOT FOR TODAY, WE'LL SEE YOU NEXT TIME.